Bees are a type of flying insect classified as similar to ants and wasps, all of the order Hymenoptera. They are an important pollinator of flowering plants, and vital to commercial growers in the United States. 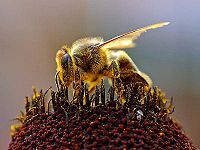 Many species of bees produce honey. Unfertilized eggs laid by a queen bee contain 50% of her genes in different combinations. These eggs develop into male bees (drones) that have one copy of each chromosome. All sperm produced by a drone are identical clones. Fertilized eggs laid by a queen bee develop into female bees (workers). These have two copies of each chromosome – one from the queen and one from the male who fertilized her. Queens mate with 10-20 drones, so bee colonies are a mixture of subfamilies with the same mother but different fathers. This means that workers in the same subfamily are related by 75% of their genes. They are therefore more closely related to their sisters than to their own offspring, who would only have 50% of their genes. Albert Einstein wrote, "If the bee disappeared off the surface of the globe then man would only have four years of life left." Because of their vital role as pollinators, bees are responsible for 15 to 30 percent of the food U.S. consumers eat. However, in recent years there has been a steep decline in the population of bees, and some scientists claim that unless this is arrested the supply of some fruits and vegetables may also decline. This decline is considered to be the result of diseases such as the varroa mite and other parasites, and the widespread practice of spraying crops with pesticides. Some liberal activists have asserted that the increased use of genetically modified crops may have a role to play, but the evidence for that is not there. Another theory, cellular phone signals may be interfering with bee populations. This page was last modified on 9 April 2019, at 00:34.